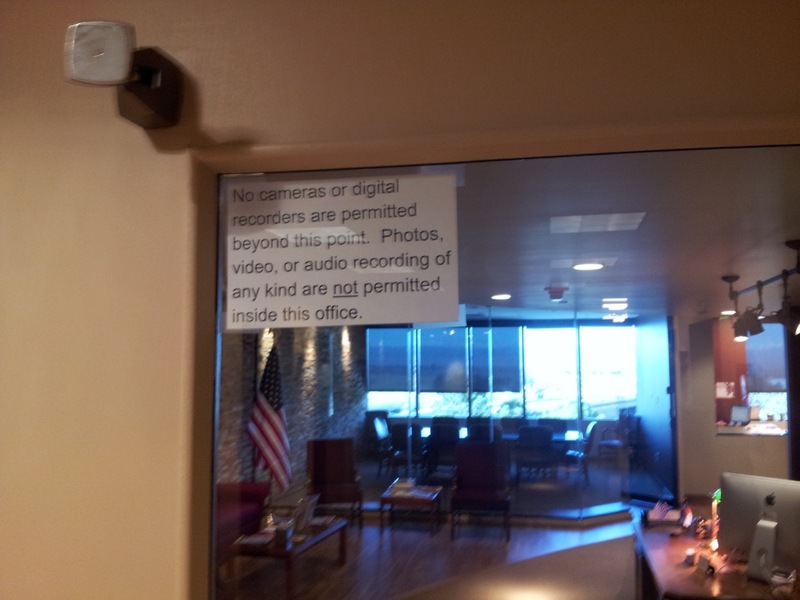 It's hard to miss this warning sign posted by the door as you enter the district office of Rep. Mike Coffman on South Parker Road: "The use of video recording devices, still cameras or digital recorders are NOT permitted inside the office." If you take the sign seriously, reporters visiting Coffman's office could record neither peep nor pushup from Coffman. "Assuming he welcomes journalists in the office to meet with the Congressman, why is he barring them from showing the public in real time what actually is going on there?" asked Kelley. "I think it's bad policy. It suggests that there's something to hide inside that office. If he would bar disruptive behavior or something like that, it would be different. But clearly his intent is to prevent being embarrassed, which he's had some experience with recently over the gaffe on the President's citizenship. It's hard not to wonder if this isn't in response to that. All of which doesn't speak well of the Congressman's willingness to be transparent and accountable." "I would hope that he or any Congressman on either side of the aisle would reconsider," said Kelley, adding that if someone were to take Coffman to court to force him to allow recording devices in the office, he or she would likely lose. Drew Kerin, a staffer at Coffman's Aurora office, told me that the policy of banning recording devices came at the "strong recommendation" of the U.S. Capitol Police. Kerin added that he personally spoke to the U.S. Capitol Police about the matter. "Each Member of Congress's district office is responsible for their workplace policies," said Officer Shennell Antrobus, a spokesperson for the United States Capitol Police, in response to an email asking whether the U.S. Capitol Police advised Coffman to ban the use of recording devices, and if so, why. "The USCP considers any correspondence with Members of Congress and their offices confidential and security sensitive. Therefore, we generally abstain from discussing privileged information to preserve confidentiality." In a limited survey, I couldn't find a congressional office that totally bans the use of recording devices, like Coffman's office does. So if this is indeed a recommendation of the USCP, it's apparently widely rejected. 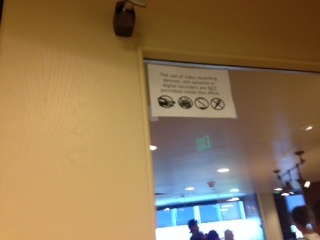 Offices sometimes ask visitors to restrict the use of recording devices in some circumstances. You wonder, what possible security threat comes from operating your phone camera in a congressional office, especially if the device itself is allowed in the office, as long as it's not recording anything? I'll do some research on that and report back. The photo immediately below was taken this month at Coffman's office. The other one was shot in December.